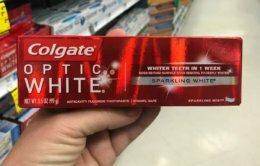 New $5/3 Colgate Oral Care Products Coupon – Up To 12 FREE + Big Money Maker at ShopRite & More! Through 1/26, ShopRite has the Colgate Optic White Stain Fighter Toothpaste on Pick 4 Pay $1.49 each (you must buy in increments of 4, limit 4 offers) The best part of this deal is you can score up to 12 of these FREE or you can get just 8 FREE but score yourself a bigger money maker! Save up to 34% on Diaper Bags at Amazon!